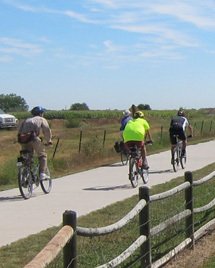 Groups should be in single file when other trail users are present. Control your speed! Travel at safe speeds that allow time to react to unforeseen hazards and allows the ability to slow down for corners and other trail users. Slow down and use caution when approaching or overtaking other trail users. Let them know if you are passing. Who Yields the Trail? Before passing another trail user make your approach known well in advance. Cyclists are encouraged to have and ring a bell when passing. A friendly greeting “passing on your left,” also works well. Respect the resources: Look at wildlife from a distance, leave wildflowers and plants for others to enjoy, and stay on the designated trail. Always look in front and behind before changing positions on the trail. Be respectful of private property. 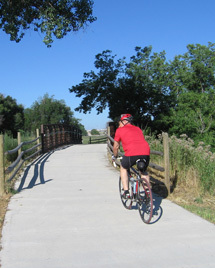 The Poudre River Trail is open to the public, but most of the adjacent land is private property. In many cases, adjacent landowners were generous in donating the land which the trail is located on. Practice the “Leave No Trace” principles. Be sensitive to the area, stay on existing trails and pack out at least as much as you take in.